There are so many different quilt marking tools available to us sewers, it can be a little bit overwhelming and a LOT bit scary since many of them come with their own whispered horror story. Let me do my best to clear away the mystery surrounding some of these tools so you can go forth and draw guide marks with confidence. This post was inspired when an IG follower recently requested that I post a tutorial on how to quilt straight lines. Now, I don’t know if they expected me to dive as deeply into the process as I am doing here, but I thought I might as well...because I love you and you inspire me to be a better quilter. MUAH! You should know that I try my best to be efficient while being accurate, however I am not a perfectionist. I think finished and good is always better than unfinished and perfect. 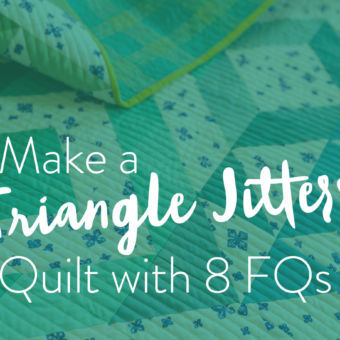 When you see a quilt like the one below, my Triangle Jitters quilt (pattern available in the shop), I should tell you that I did not use any quilt marking tools. I eye-balled the whole thing. It's not perfect, but it's pretty close and that's good enough for me. In this case I used the side of my walking foot as a guide rather than painstakingly drawing out guidelines. However, throughout the process of piecing a quilt and when hand quilting, I draw a lot of guide marks. So keep in mind that when using quilt marking tools, there is definitely a right way, a wrong way and an "OH MY GOSH NOOOOO!" way. Stay tuned for a first-hand dramatic tale of the OMGN way, starring yours truly. 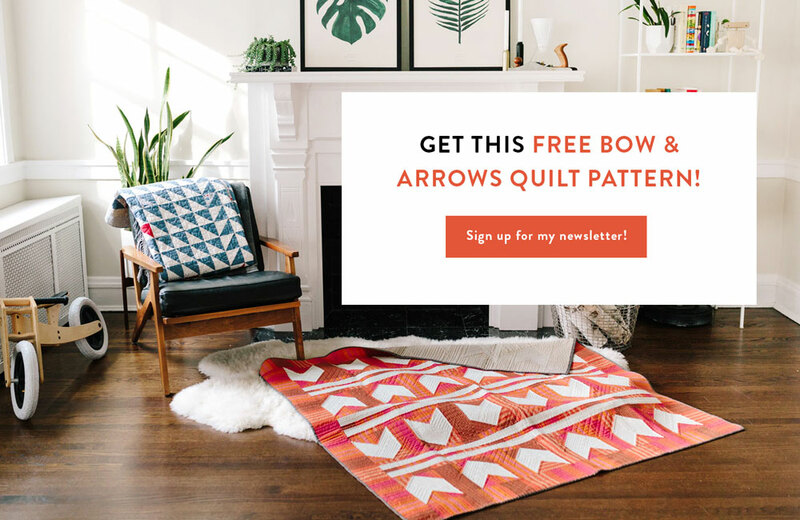 But first… here are some great options for marking your quilt so your lines are as straight… or as curvy… as you dreamed they could be (you better be reading, person who requested this post). 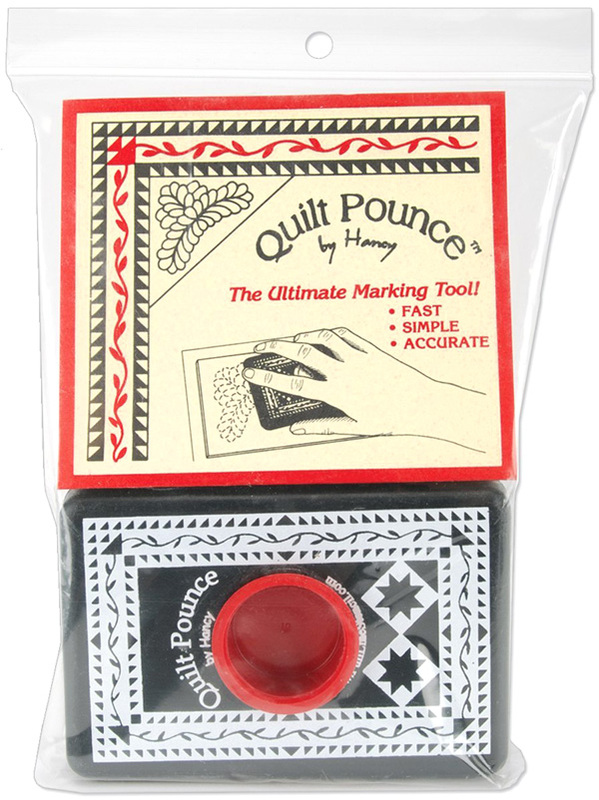 It's no secret that this funny little quilt marking tool is my favorite. I get a lot of great tips from my fellow quilters on social media and this marking tool might be my favorite tip yet. Yes, it is basically the equivalent of a dull butter knife, but because of its smooth finish it will never ever ever snag your fabric...unlike a dull butter knife. It creates a crease in the fabric, so no actual marks are ever made – just a subtle guideline. When a Hera Marker and a ruler get together, they make the best straight lines without leaving A SINGLE MARK on your fabric. So no worrying, "Will it wash out? Will it rub out? Will it lick out??" Great for lefties and righties, big hands or small, you really can’t go wrong with the Hera Marker. I recently improv hand quilted for the first time. Technically, I guess it was only 85% improv because I did use my trusty Hera Marker to make guide marks a few steps a head of my stitching. I sewed beautifully organic looking freehanded hills all over this Fly Away quilt (pattern available for instant download in the shop). You can see the photo above. Did I really need these guidelines to do my curvy improv hand quilting? Maybe not. 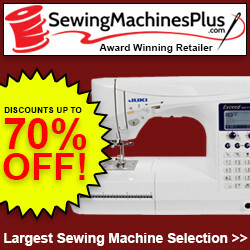 But did they help me sew faster and with more confidence? You bet! The official name for this tidy little chalk pen is Pen Style Chaco Liner. But since that sounds like a bunch of words mashed up in a name longer than the chalk pen itself, let's just call it what it is. A chalk pen. 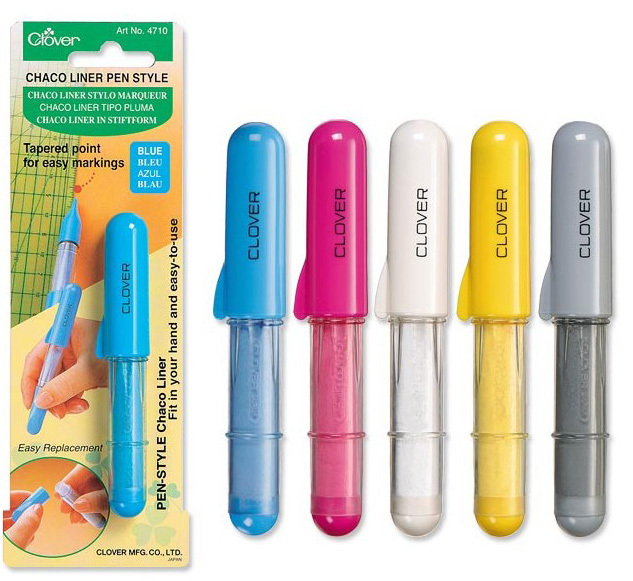 Chalk is a pretty popular choice as a quilt marking tool, and this Clover chalk pen (also in a cool, triangle shape) has a nice, smooth feel to it. 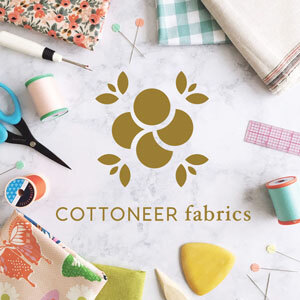 Definitely do a fabric test before using it, and don’t press too hard (read about these tips and more below). I like to use contrasting chalk when drawing my guidelines for half square triangles. One thing I've noticed though, is that if you stack fabric on top of fabric, the chalk can smudge off – getting where you don't want it to be and erasing your guideline. 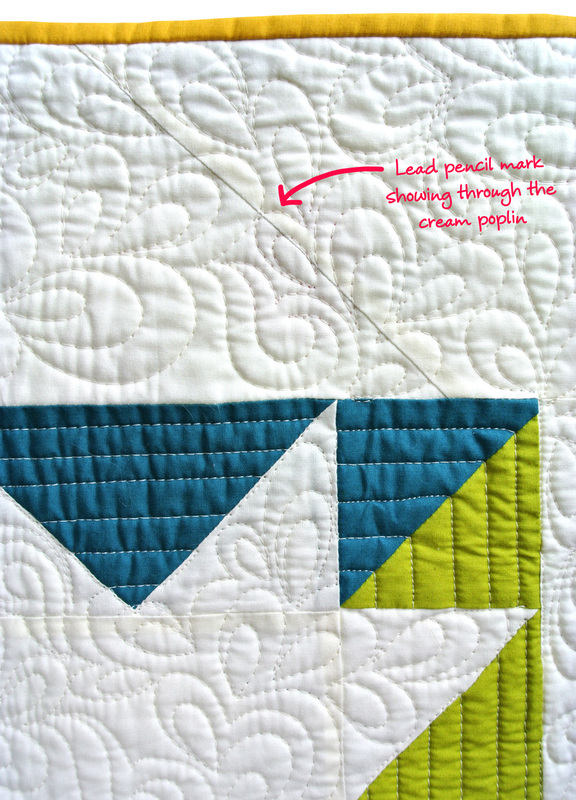 I personally don’t use chalk on a finished quilt top because I’m scared… er… smart. During some of my fabric swatch testing, the chalk hasn't completely come out. So always always test. It don't need to be pretty and it don't need to be fancy. 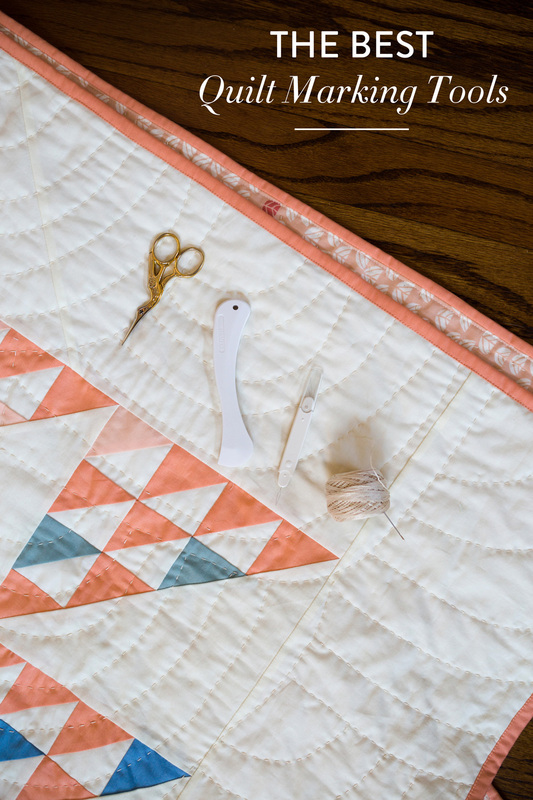 I used masking tape as my go-to quilt marking tool before discovering the Hera Marker. In my How to Baste a Quilt tutorial I mention the importance of using wide tape when sticking your backing to the floor. The opposite is true in this case. Find something in the 3/4" range. Lay your ruler down and place the edge of the tape against the ruler and onto the fabric. You can use the same piece of tape many times, because it doesn't need to remain sticky, just tacky enough to stay on the fabric. 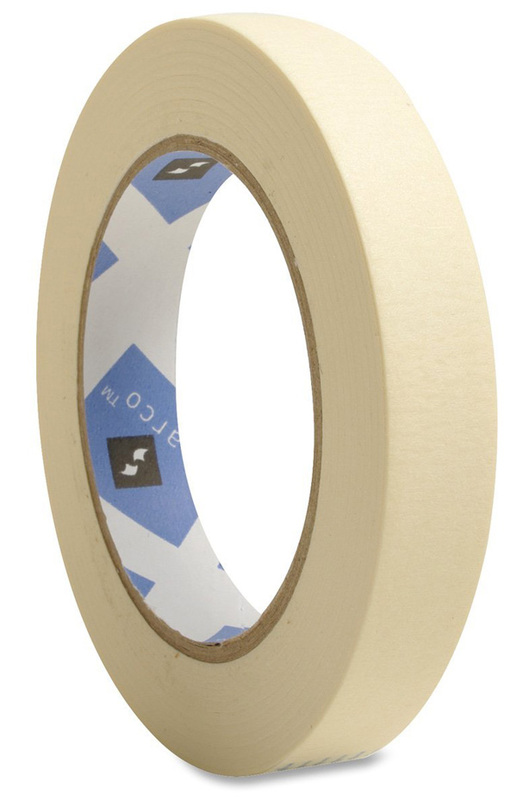 I love tape for the same reason I love my Hera – no visible marks. Masking tape is better for those who cannot see the faint crease lines made by a Hera Marker. If I don't have my glasses cleaned well and all of the lights on, I struggle to see the Hera guidelines. It's really hard to do any kind of design other than straight lines. 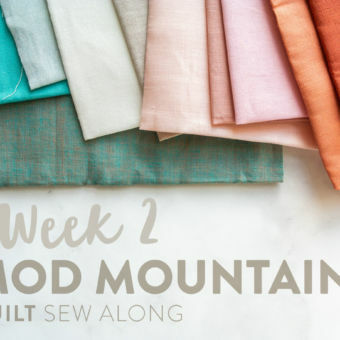 Even after reusing a piece of tape multiple times, once finished with a quilt, you're still left with a wad of tape to throw into the garbage – making this option not very eco-friendly. The cool kid quilters are talking about this thing called “Quilt Pounce,” where you can transfer stencils onto fabric by running the pounce pad, kind of like a chalky ink pad, over the design to transfer it. I have not tried this, so I am very curious for your reviews if you have. If this quilt marking tool lives up to the hype, it's definitely an efficient and accurate method if you’re using stencils! These nifty little pencils claim to disappear when wiped off with water. The great part about them? 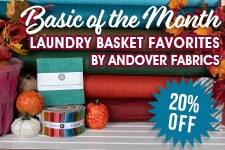 They come in different colors so you can switch them out based on the fabric you have. I know I'm sounding like a broken record, ya'll, but test these babies before using them. To be really safe, test them over time and heat. I have heard quilt horror stories about phantom guide marks rising from the dead weeks later. That could be a scary story quilters only tell while huddled around campfires, but it has scared me to my core nonetheless. So much so, that I am passing this fable along to you. I know, it pretty much sounds like a pen from the future… but they actually make pens with ink that disappears IN AIR. Basically, you can make marks that will disappear over time. You know what I'm going to say next. So I'm not even going to say it. OK I'm totally going to say it. TEST FIRST! Follow Directions. It’s so simple, yet so inexplicably hard sometimes. I want to just be like, hey, I know how to use a pen, and throw the packaging away… but resist the urge. Some marking tools have specific instructions, especially regarding contact with water or heat. Do your homework. You’ll never regret it. Test It First: Did you think I wasn't going to take one last opportunity to mention this? 😉 Do a quick test on every piece of fabric you want to use it on to see if the marks actually disappear completely. It’ll take you 10 seconds, and save you from a world of pain and grief....and depression and crying and wandering around your neighborhood shouting heavenward, "Why didn't I just do a TEST???" Don’t Press Too Hard. Now, I know all of you are logical, clear-headed people, but there’s a fine line between simply pressing, and pressing too hard. This is especially true for any pens or pencils with fine tips. Sharp pencils can do damage to your quilt! Don’t worry about not being able to see the marks, and go easy on your muscles. If you think pressing that water soluble marker is going to make it show up better, I can already tell you it won't. Chances are it's dried out and you need to replace it. Okay, so basically the title says it all, but that doesn’t make this any less of a horror story. If I would have taken a minute to do a test (or even just used my brain), I would have known. According to the manufacturer, this is actually not an erasable pen (even though the title says erasable...come on Pilot!). It is a thermo-sensitive ink gel pen – which means that even though the ink disappears when heated, it also reappears when cooled. Through various tests it seems that after using this pen on dark fabric when heat is applied, the lines actually appear ghosted rather than disappear. These pens are permanent, so the ink will not fully wash out. My conclusion is to keep these Frixion Erasable Pens away from your quilts. There are other, better products out there. 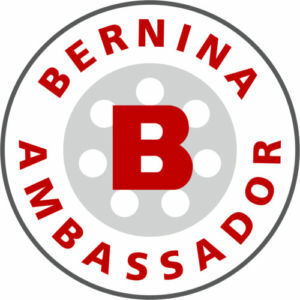 I want to hear all about your favorite quilt marking tools! What works? What doesn't work? 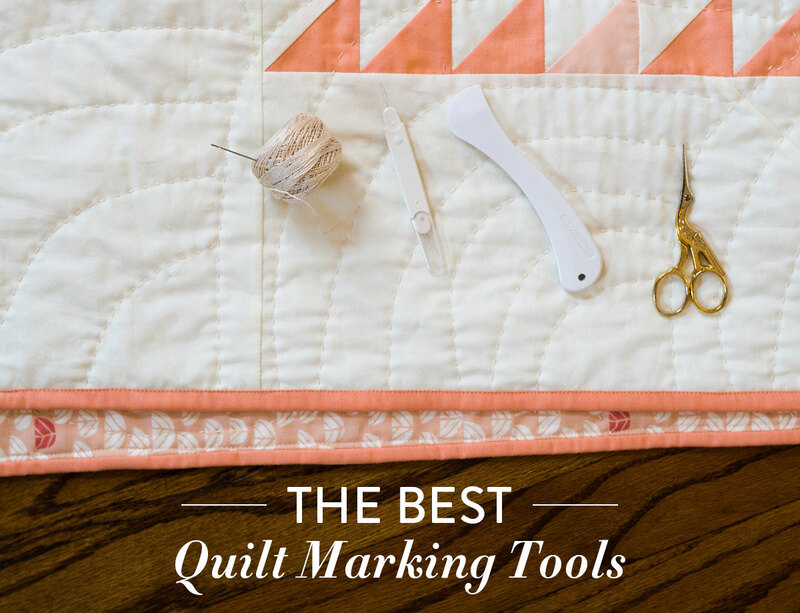 What quilt marking tools are you anxious to try? Share in the comments! I use my Hera marker to make my lines for sewing HSTs too! I really love it! I only use black and blue Frixion pens by Pilot. They do a great job of marking lines and simply disappear when you iron them. I’ve heard of the Hera markers, but following an inked line is easier for my eyes to see than one creased into the fabric. I have heard to be careful using these if you are in a cold climate. 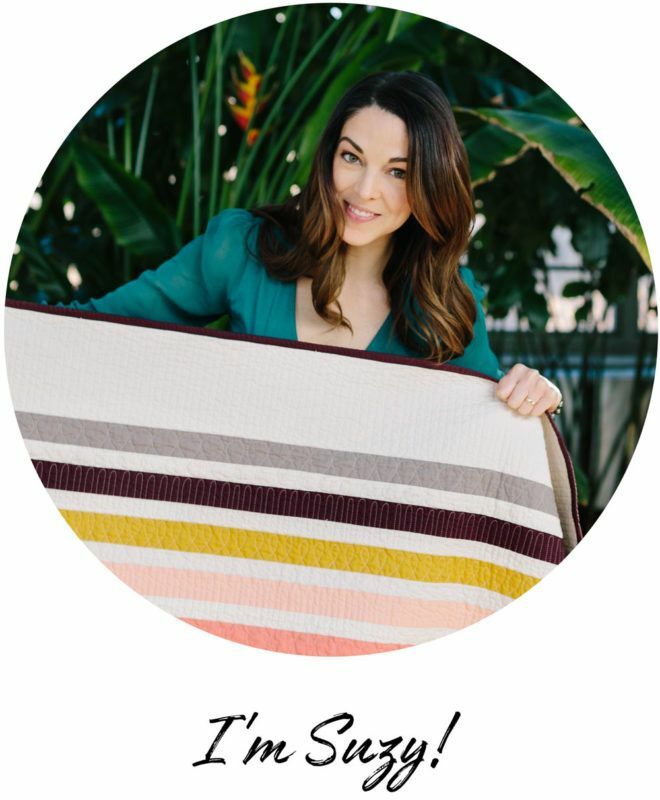 If the quilt gets cold the lines come back, and even the Frixion people say they are not for fabric. Make some marks on fabric, iron them and put in freezer. See if you are still pleased. You do know that the lines made by frixion pens appear again when cold? Frixion pens can also leave a ghost mark on darker fabrics. I still use them, but only where I know they’ll be hidden in a seam. You should try the Marvy markers. They are air soluble and my favorite for quick marking. oooooh! I’ve never heard of this magical marker! Thanks for the heads up! Thank you for the marking round-up! I have use the Pounce Pad and the marks do come out with just the steam from my iron. The Pounce comes in different colors too. The Pounce Pad has to be “primed” for the first use and you should store it upside down to prevent too much Pounce collecting on the pad. The caveat is that you need stencils to use it. There are tons available but somehow (as with fabric) I never seem to have the right one and I need to buy more! I have used the air erase pens and still have the scrap of fabric with the blue and the pink mark on it… As for my horror story, DO NOT use Frixion pens! They do erase with steam but the color creeps back. The Frixion pens even say that you can write secret messages to your friends by erasing the words and putting the paper in the freezer – the words “magically” reappear! Yikes! OK so I don’t pull my quilts out in my igloo, but who wants to take a chance? Thanks again for the post. I think I need a Hera marker and a roll of masking tape! I used Frixion pens to mark a quilt made with batik – it immediately bleached a line, not related to cold weather. I am SO glad I read these comments! My local quilt shop sells the Frixion pens out of a bucket by the register–no instructions included! They just told me it’ll go away with pressing. Definitely not going to use it anywhere visible!!! On those occasions when I am using stencils to mark the top for quilting, I use baby powder in the pouncer instead of the chalk. It’s easier to brush off, and gives the quilt a lovely scent that lingers when the quilt is in storage. (Remember that in earlier eras, paprika was often used to mark using hand-made needle-punched stencils.) I also use ceramic pens and the air soluble markers. I have a book that recommends cinnamon. I’ve tried the air soluble pens and because my kids are unpredictable I’ve found that the marks are gone when I get free time to quilt again. I’ve never heard of the Hera market and I’m excited to try it. Been there! It’s so disappointing because by the time you re-mark it, you are back to the same place! Out of time to finish!! My favorite marking tool is wash away light weight stabilizer that the machine embroiderers use . I trace my design on and either pin or use a little glue stick and attach to my project. Very easy to hand stitch through and when done I cut away any large access pieces and wash like I normally would. I like using a sharpie pen (not ball point) for tracing my design. 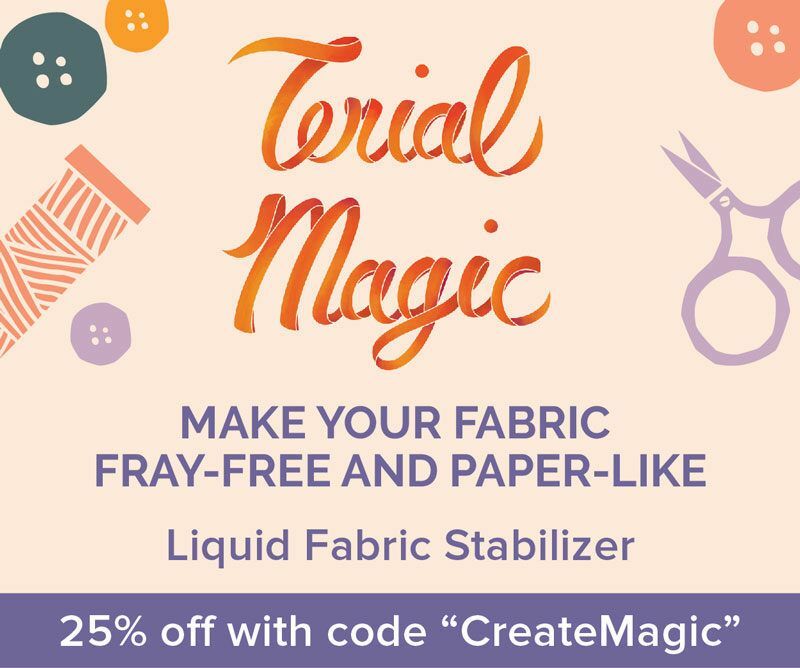 This works well on any size project from table runners to full size quilts. 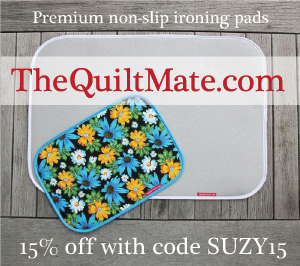 I have done my hand quilting quilts this way for many years. Judy, that’s genius! I bet you hand quilt some beautifully intricate designs. Thanks so much for sharing this wonderful tip! Judy, I do use the h2o stabilizer when doing machine embroidery and just wetting the tip of your finger and touching the stabilizer will make it stick to your quilt surface. Oh I did what you did with pencil, but with a regular ballpoint pen 😱 Not smart, but lesson definitely learned!! Now I use a chalk pencil and I have some really cool ‘quilters tape’ someone gave me that’s 1/4″ masking tape!! I don’t mark any HST, I use the angler 2 on my machine and save a ton of time! Unless they are tiny. But am looking for a Quilting marking tool. 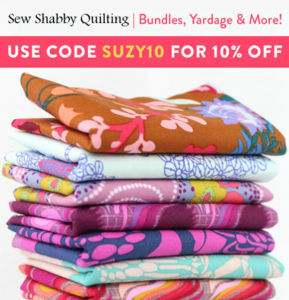 Today at work when your email came through I somewhat loudly exclaimed “Yay Suzy Quilts newsletter!” and my coworkers have been making fun of me all afternoon but it was completely worth it to come home and read this. Thanks for the Friday afternoon boost and the information! Time to go visit my quilt shops! I use the heat soluble markers that I can just iron over because I usually have to iron it anyway. 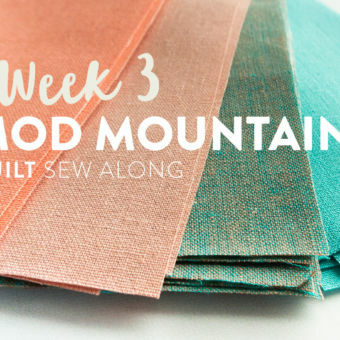 I am a beginner quilter (have only made 3 adult quilts and 1 baby quilt and almost finished another baby quilt so I don’t have much knowledge of all the mentioned methods. The Hera Marker sounds interesting. I’ve never seen them in any catalogs or websites I’ve been on that I can remember. Where can you order them from? I get most of my notions from Amazon because they arrive in two days and are usually cheaper than anywhere else. If you click the Hera Marker link or image, it will take you to the Amazon page where I got mine. I have only used masking tape since I’ve only done straight line quilting so far. I love your tips. Thanks for sharing! Brilliant information thank you. I’m off to get myself a Hera. 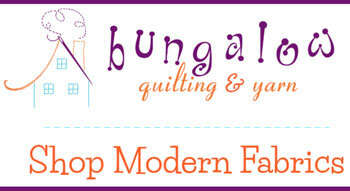 I’ve only recently come across your blog/site and it’s exactly what I need for venturing further into quilt making. Your contemporary style resonates with me, thank you very much for the tips and tricks. I’m so happy to hear that! Thanks, Andrea! When quilting straight lines on your machine, do you always go in the same direction? I try to. I used to quilt back and forth but found the the fabric pulls slightly according to the direction you’re sewing. It you sew lines going the same direction, that pulling is not as visible. Want to hear an even scarier horror story?! Einstein here was using a frixon to mark my seams on a hexie quilt made from 1930’s reproduction and white precuts. I don’t really know what happened but I marked a gazillion hexies and stopped for something and then started back. After a gazillion more hexies I looked at my hand and I had accidentally picked up a fine tip Sharpie Marker and had been using that by mistake!!! I just sewed them up anyway and right now it is still a UFO. This one was for me so I’ll just finish it, use it and laugh at myself every time I see a little black dot! Oh my goodness, Fran! I can see myself doing the exact same thing!! It’s so good that you have a sense of humor about it. I love my Hera marker and it’s my most often used tool for marking. I have water soluble pens which I love too. Unfortunately I bought some highlighters and one was a blue, like the water soluble pen. You guessed it I marked a stitching line with highlighter. Lesson learned. What a great post Suzy. Thanks for sharing your trials, tribulations and horror story. Oh no! But what an easy mistake to make. I hope it washed out a little bit? Maybe faded enough to not be noticeable? Thank you for your sharing your experience Susy, it is really helpful. I also have a horror story with the chalk marker, I had used it before, but this time I forgot that the line was on the right side, I need to pressed it because I am doing a quilt that is quilted by parts, so I pressed the joint, exactly where I marked!! After finished, I remember that some markers gets permanent wIth hot, and I read on the web, this is the case, I haven’t washed it yet, I don’t know if it’ll come out!! I think I am not ready to discover the outcome! I have used blue painter tape, it’s not as sticky as masking tape but you can reuse each piece many times. I just finished a larger quilt and used my wood sylus (pointy stick) and a short ruler to mark straight lines as I worked my was along. Worked great and NO tape. Marking is so frustrating because of needing different colors to show up on dark and light fabrics. Seems like the ones that are satisfactory are always incompatible. That is, if one irons away, the other has to be washed away and will be set if you iron it. That’s why I’ve pretty much settled on Frixion pens. Also, if you make a mistake marking, it’s a lot easier to get rid of the wrong lines. I’ve heard a rumor that if you wash your quilt after ironing away the lines, they won’t come back with cold, but I haven’t tested that yet. I was marking a quilt top with a Frixion pen, stopped to do something, came back and had marked the next block when I realized I had used a ball point pen. I tried all the tricks and finally found a stain remover on Amazon that took it out. That was stressful to say the least. Very stressful! What stain remover did you find? Sounds like a miracle worker! I have a Hera marker that I thought was just a presser/creaser (I threw away the packaging) and never heard of using it as a marker. Thanks so much for the tips and I will definitely being using it to mark my quilting lines now. Oh bummer. That’s a real shame. I feel the need to have a moment of silence for your quilt before launching into possible solutions. OK. Moment over. Let’s fix it! First off, I’d have a long talk with that hand quilter. If that person is going to spend the time to stitch every single stitch by hand, I have a hard time believing that they used a lead pencil without a solution on getting it out. If they don’t have a good fix, you could try a few different things. First, and easiest, rub a clean pencil eraser on the areas. Sometimes that simple solution works. If that still leaves lead residue, treat the areas like a stain and use something like OxiClean to spot scrub the lead out. 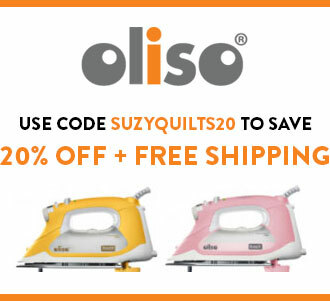 As soon as you have used the OxiClean or detergent, you will want to fully wash the quilt. Check out this article on fabric bleeds to read about soaking a problematic quilt. I use frixion pens all the time and as long as I use them lightly and a warm iron with NO STEAM I have no problems. Steam seems to set a white mark in. I live in Australia so there’s no problem with the super cold issue here! Yes this is my experience, frixxion pens work well, very smooth surfaced fabrics seem more likely to leave white ghosts, but as always test first. We don’t get too many frosts in the UK these days so return g isn’t a problem. Will try pounce for speed though..
I’ve heard that if you heavily starch your fabric the pencil lines would technically be on the starch instead of the fabric and it will wash out easier. huh, I never thought about it like that, but you’re probably right. Great tip! hmmm…you will probably need to get a water soluble marker for that. That’s my guess. Jennifer that is brilliant!! I’m stealing my son’s markers tonight! I used the Clover water soluble blue pen on my most recent quilt and quilted it over a few days and immediately washed it – markings from that morning washed out, but the ones from earlier in the week didn’t. :/ I’m not going to focus on the slightly yellowed dots and I hope my sister doesn’t either!! Another item that you might already have on hand is one of those pattern markers with the wheel. It makes a crease in the fabric only. Just don’t press too hard! Thank you so much for all the ideas. I am a hand quilter and use a hoop so my quilts are handled quite a lot in the quilting process. I have tried chalk makers (Bohin), pounce pads, and Fine Line stencil marker, washable pens, you name it. Nothing seems to work well on intricate designs. Chalk, even the kind that says it won’t disappear until you iron it, disappears before I can get it quilted. AAARGH!!! Somewhere in my sewing stuff there is a Hera, but I doubt it would work on small bear pawprints (especially toes and claws). The light weight stabilizer and the washable markers for kids sound promising, but will definitely test first. 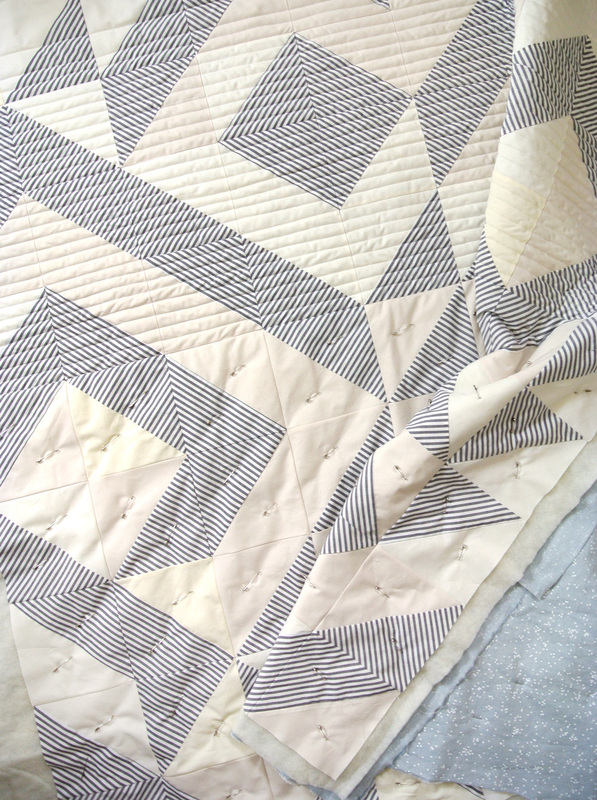 I have used masking tape and the 1/4″ quilter’s tape for straight lines – work great. Again thanks for all the wonderful ideas. Happy quilting! I’m off to look for Marvy markers! Thanks for all the great ideas!